Boys and girls from ages 5-14 donned the Black and Gold colors associated with the Milton Parks Department to play organized sports. For the Panthers, they got to play in a controlled scrimmage setting against the East Milton Jaguars prior to Milton High School taking the field for their Black and Gold scrimmage. 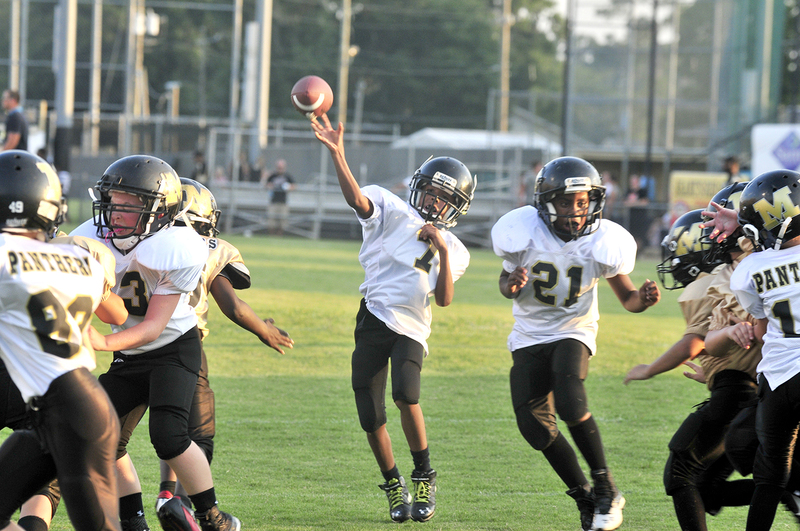 On Aug. 29, they will begin play as new members of the Northwest Florida Youth Sports Alliance (NWFYSA), which is accredited with the USA Heads Up football initiated by the National Football League. Having the task of finding the coaches and equipment for these young people has not been an easy task for Norton, but it is one he thoroughly enjoys. “Nationally the trend regarding football has seen registrations declining, but that isn’t the case with the Milton youth program,” Norton said. “We have been blessed to see our numbers steadily increase year after year. During the season Milton will compete against teams from Perdido, Gulf Breeze, Navarre, Bellview, Cantonment, East Milton, Salvation Army (Pensacola), and Pace. This year the Milton teams will play football in specific age divisions for the first time – U6 (Mighty Mites); U7 (Mini Mite Black); U8 (Mini Mite Gold); U9 (Mite Black); U10 (Mite Gold); U11 (Midget Black); U12 (Midget Gold); and U14 (Juniors). By grouping players this way Norton along with the NWFYSA hope to help players develop and play against players their own age and relative size. Milton will play home games on Aug. 29 to start the season against Navarre, as well as Sept. 19 (East Milton) Oct. 10 (Pace), and Oct. 24 against Perdido. Games at the Milton SportsPlex, 5629 Byrom St. in Milton, will get underway as early as 8 a.m. with the final game starting at 6 p.m.